Lake Havasu ATV Rentals, Boat Rentals, Sea-Doos, Jet Ski Rentals, Pontoons, Ski Boat Rentals NOW we also have available Kayak Rentals! 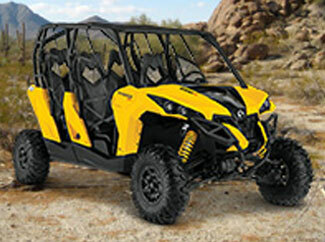 Can-Am Maverick Tours available! Call for Special ATV rentals orTour Package. Servicing Needles Marina, and Topock Marina Adjacent to Pirates Cove. 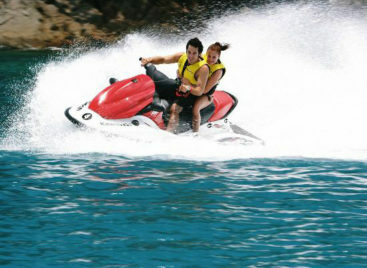 IF YOU WANT TO HAVE A FUN TIME ON THE LAKE CALL WET MONKEY POWERSPORT FOR LAKE HAVASU ATV RENTALS, BOAT RENTALS AND ALL YOUR ARIZONA WATER SPORTS DESERT SPORTS REQUIREMENTS. COME ENJOY THE DESERT SUN AS WE LAUNCH YOU FROM WINDSOR BEACH, AND WHEN THE DAY IS OVER YOU'LL KNOW WE'RE A STEP ABOVE THE REST! 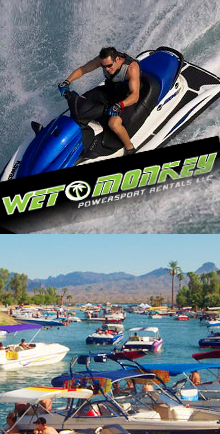 Wet Monkey Powersports is your #1 choice for Arizona off-road sports and watersports. 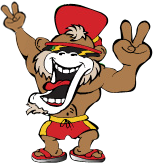 Come to Havasu or Parker Arizona and have a fun time on the water or in the dirt in a premier Wet Monkey boat rental or ATV rentals. We are only hours from Las Vegas and California. Come and try your water skiing and wakeboarding skills behind a top quality Wet Monkey Boat Rental or blaze the desert in one of our new ATV. You can also stop and have lunch at the many hot spots right near the water shore or pack your own and find a beautiful cove or off-road dunes to enjoy. Come and hang out with friends and family and enjoy the lake in a Ski or Pontoon boat rental or our side by side and cruise the desert. The recreational possibilities are endless, and so is the FUN. We will provide information on where to go and what to see on the lake or off. NEW LOCATION!! We are conveniently located inside of Windsor Beach State Park at the Jet Launch ramp and minutes from London Bridge. 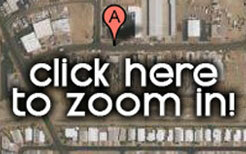 We also deliver boat rentals and watercraft to Parker and most campgrounds in Havasu and along the river. 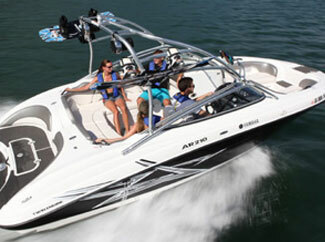 We provide only quality boats and jet skis. We have all the necessary equipment to make your day on the lake a great experience with professional assistance and boating instruction. Safe Boating is fun Boating. Lake Havasu Living at its finest. The London Bridge was purchased for $2,460,000 and brought to Lake Havasu City where it spans the London Bridge Channel. It Measures 930 feet long, 49 feet wide, has 5 arches, and was reassembled using the original 10,276 stones from London England where it spanned the River Thames. It opened in 1971 with marching bands, media and plenty of fanfare. The Center Piece of a blue water dream called Lake Havasu City. The best way to see the London Bridge is by far a watercraft. Boat rental is a snap with WetMonkey Rentals. We will provide you with a high quality rental and all the required equipment to make your day at the London Bridge and behond the memory of a life time for your family and friends.